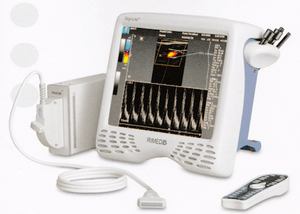 Offers an optional imaging probe for complete and accurate color-coded ultrasound scanning of the Carotid system. Each 2 MHz probe can insonate the brain in 64 different depths/gates at the same time, displaying 8 different Doppler spectrum windows simultaneously. Short examination time and increased probability to detect pathologies. Summary Screen enabling the immediate comparison between the right and the left sides of the brain. Final Patient Report includes several segments and provides a detailed and customizable comprehensive "picture" for the referring physician. A complete array of monitoring studies including Vasomotor Reactivity Test (VMR) and CO2 Reactivity Test. Studies can be saved and easily replayed on the Digi-Lite™ LCD display. Dedicated and well established emboli detection software. Can detect flow velocity at the contra- lateral side of the brain with its high Doppler sensitivity. Fully portable and mobile machine enabling operation through the touch screen alone. Offers a complete range of probes including 1 MHz, 2 MHz, 4 MHz, 8 MHz and 16 MHz probes, each with a separate connector.